With the end of May approaching most of the seeds and seedlings have already been planted. During the last month we are able to see what seedlings have taken root and are well on their way, and which ones have not. Thankfully about 99% of the seedlings do very well and have already doubled their size. 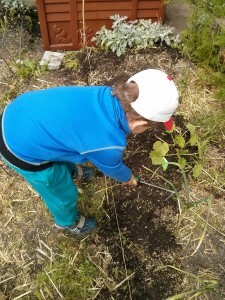 Now comes another step – sowing seeds. The seeds are going to be for plants like carrots, corn and onions which can be planted around and alongside the garden beds. Today was the carrot seeds’ turn. 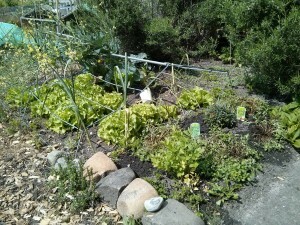 The main bed is hosting pumpkin and zucchini, and on all the way around are carrots, leaks and garlic. The leaks are from last year, having lasted right through the winter. 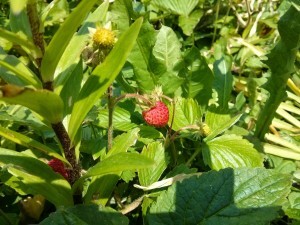 This year we are also going to be blessed with an abundance of something very special – wild strawberries. They are normally found in forests and are about a quarter or third of the size of your regular store-bought variety, but they taste incredible. Last year I had noticed that a side furrow in the garden had these wild strawberries scattered here and there, so I thought I would clean up the area and remove all the weeds and undesireables. This year, after the daffodils and tulips came and went, around 70% of the bed is filled with these delicious red berries. 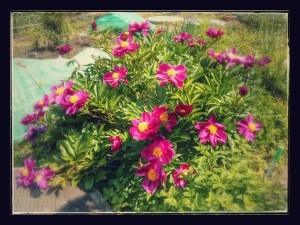 And of course just when I think the flowers have now bloomed and seeded, out come a whole new bunch of them.